Our local weather information is measured on-site by a Davis Vantage Pro 2 weather station, pictured below. Why the Davis Vantage Pro 2? Few consumer-level stations are capable of accurate measurements at high elevations. We’re at 7500′ (about 2300m), so that’s an issue for us. The Vantage Pro 2 is accurate up to 12,500′. 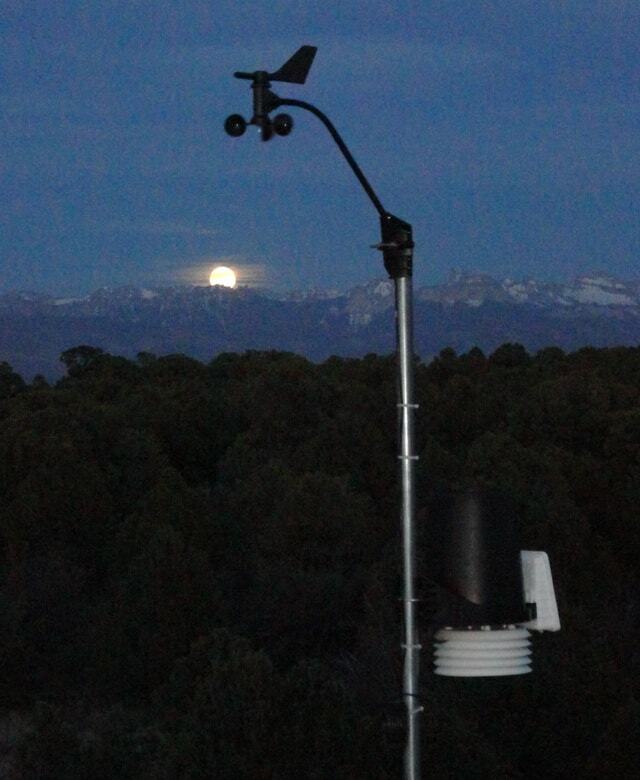 The moon rises over Log Hill’s Davis weather station. Davis Instruments has a reputation for “professional quality” instruments, and the Vantage Pro 2 specifically covers our elevation. It’s a wireless system, so we can have the console wherever we want it without having to worry about routing wires. But that brings up a question: how often does it transmit the data? I wanted to ensure I didn’t lose peak wind information because the gust didn’t happen to occur while it was transmitting. The Vantage Pro 2 transmits updates to the console every 2.5 seconds, minimizing the chances of data loss. It measures barometric pressure, temperature, humidity, rainfall, rain rate, wind speed and direction, and records each variable for at least 24 hours so you can see trends. By interfacing it with a computer (which costs extra, damn them! ), you can plot trends over long periods of time — and send the data to a web page, as we have done. I didn’t like the Davis-provided software, which you have to buy if you want the computer interface cable. 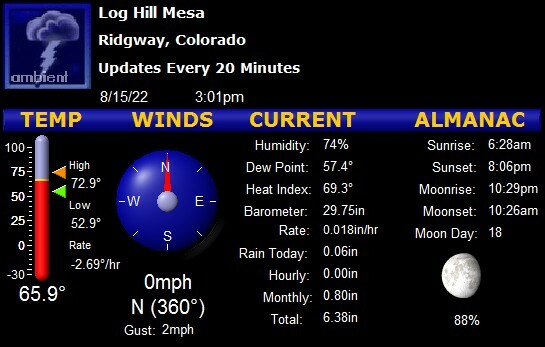 We’re using the software from Ambient Weather, which is better but still has some weird aspects to it. We purchased the station hardware through an authorized dealer who was offering it at a great price on eBay.